An article on the general conditions, traditions, terroir, and geography of the Haut Medoc. Here are some profiles of some of the more interesting chateaux from the large and somewhat diverse Haut Medoc appellation. Please click on the links (where available) for much more information. Located adjacent to (in fact just north of) Ch. Sociando Mallet, Ch. Pontoise Cabarrus lends itself to the argument for using proximity to famous chateau to help find the best values in wine. The vineyard is planted to 45% Cabernet Sauvignon, 45% Merlot, 6% Petite Verdot, and 4% Cabernet Franc but rather more Cabernet is used in the grand vin (labeled Ch. Pontoise Cabarrus) and rather more of the Merlot is used in the second wine (labeled Ch. Hauts de Plaisance and rarely exported). Under the same family ownership (Bignon-Cordier) as Ch. Talbot (St. Julien), Senjac is located in Le Pian de Medoc between Margaux and the city of Bordeaux in the southernmost part of the Haut Medoc. The cepage is 48% Cabernet Sauvignon, 37% Merlot, 11% Cabernet Franc, and 4% Petite Verdot. From south of Margaux (Macau) and so more Margaux-like. The wine is a blend of 50% Cabernet Sauvignon, 27% Merlot, 20% Petit Verdot and 3% Carmenere. Reserve Class Champion buckle winner at the 2013 Houston Livestock Show and Rodeo International Wine Competition. Located south of the Margaux appellation and a member of Biturica, Cambon La Pelouse is a blend of 50% Merlot, 47% Cabernet Sauvignon, and 3% Petit Verdot aged 14 months in French oak barrels (40% new). 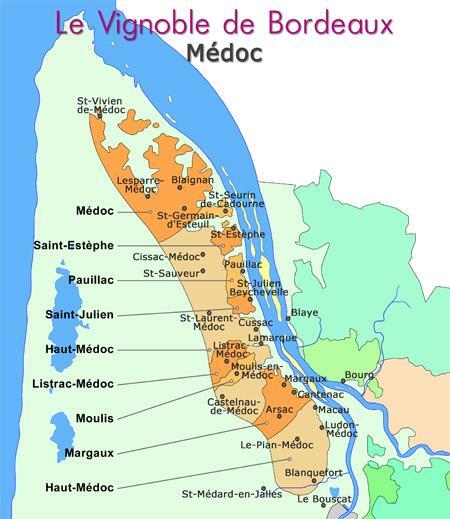 Located to the west of St. Julien in St. Laurent de Medoc, Ch. Camensac (a classified 5th growth in the 1855 classification) is planted to 60% Cabernet Sauvignon and 40% Merlot. Fermentation is steel and concrete tanks and aging French oak barrels (at least 33% new with more in the better years). A classified 5th Growth in the classification of 1855 located south of the Margaux appellation (in Macau), Ch. Cantemerle is planted to 60% Cabernet Sauvignon, 30% Merlot, 6% Cabernet Franc, and 4% Petit Verdot fermented in conical wooden vats and aged 16 months including 12 months in French oak barrels (50% new). Owned (and revived) by the Nony branch of Bordeaux’s famous Borie family and located just to the west of the St. Julien appellation (and quite near to Ch. Talbot), Ch. Caronne St. Gemme sits on a gravel rise ideally suited to Cabernet Sauvignon. The estate is planted to approximately 60% Cabernet Sauvignon, 35% Merlot, and 5% Petite Verdot. The wine is fermented in a mix of Concrete and stainless Steel tanks and aged 20 months in all French oak barrels (+/-33% new). A 3rd growth in the 1855 classification located in Ludon close to (south of) the Margaux appellation, La Lagune is planted to 60% Cabernet Sauvignon, 20% Merlot, 10% Cabernet Franc, and 10% Petit Verdot. Located near Cissac on the western edge of Pauillac. Very well known due to the distribution it got from Seagrams’s Chateau and Estate Wine Company in the 1980s and 1990s but its fame is bigger than its quality which at best is good and sometimes seems less than that. Perfectly developed and drinking beautifully, this 2001 Malescasse was recently bought directly from the chateau and shipped to us in Texas. The aromas have developed into a bouquet (which is the whole point of aging red Bordeaux) and the wine is nothing short of lovely. If you want to try a mature red from Bordeaux, this is a great place to start. Located south of Margaux in Ludon, Ch. Paloumey is a blend of 62% Cabernet Sauvignon, 35% Merlot, and 3% Cabernet Franc aged 12 moths in 90% French and 10% American oak barrels (30% new). An approximately half Cabernets, half Merlot blend of what doesn’t make the cut for the grand vin at Margaux’s Ch. Pontac Lynch with anther Pontac Lynch-owned vineyard further north in the Haut Medoc area between Margaux and St. Julien. The wine is in the more elegant style of Margaux. Located on gravel mounds close to the Gironde in Saint Seurin de Cadourne north of St. Estephe, Sociando is one of the best known and most highly critically acclaimed wines of the Haut Medoc appellation. Made at Ch. Retout in Cussac Fort de Medoc (on a gravel mound between Margaux and St. Julien) by owners Helene and Frederic Soual Kopp, their Ch. Tour Salvet is a more modern, less rustic blend of 75% Cabernet Sauvignon, 23% Merlot, and 2% Cabernet Franc fermented in temperature-controlled, epoxy-lined concrete tanks and aged 12 months in tanks (40%) and oak barrels (60%) with 25% of the barrels new each year. These are nice folks doing good work. A blend of 56% Cabernet and 44% Merlot from west of Margaux by Marie Laure Lurton. The wine from the Haut Medoc vines of St. Julien’s Chateau Beychevelle cannot be sold as St. Julien so the wine is sold as “les Brulieres de Ch. Beychevelle” with an Haut Medoc appellation.